Im not sure what Im doing wrong! Im trying to burn avi files onto a DVD. Ive not had problems before, but Roxio wont accept the files. The file you are trying to use cannot be edited and has not been added. Can some one please help me sort this out. Not a single reply in two weeks? This problem is still happening. "The file you are trying to use cannot be edited and has not been added." What is the name of the actual Roxio program you're using? I gather you're wanting to convert those files and burn them to a Video-DVD. Is that correct? If so, the reason you're seeing those crossed-circle symbols is most likely because your system can't decode the AVIs - if that's what the files actually are. AVI files are video which has been compressed by a video compressor of some sort, and put into an AVI container. To play or edit or otherwise use the AVIs you need to de-compress the video, and for this you need a decompressor which matches or can handle files made by the compressor which was originally used. The COmpressor-DECompressor software is called a CODEC. If your computer used to be able to handle the same sort of files that you're working with, but now it can't, then the CODEC needed for them has been removed, disabled, or broken. 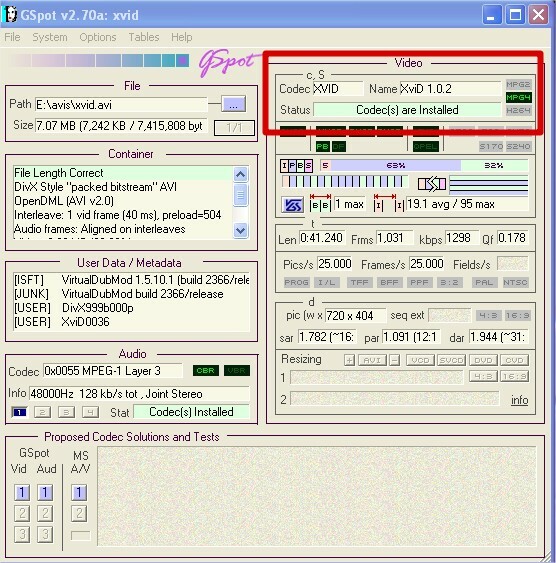 If your computer has never seen this type of file before, and it is an AVI, then the required CODEC isn't installed. Would you please tell me which of those two alternatives applies? -Run the program and then drag one of your files onto the GSpot window. The program will analyze your AVI and tell us what we need to know. Here's a GSpot window showing an AVI I just dragged onto it. The interesting part is at the top right, and I've put a red box around it. It says the Codec used on this AVI was 'XVID' and that the necessary Codec(s) are installed. What does GSpot show under those headings about your AVI files, please? Thank you so much. The Gspot program revealed that the correct codecs were either not installed or undetermined. To confirm this I tried watching the avi with windows media player (Ive always used VLC) and there was sound but no picture. So I downloaded the codecs package and everything is working now! YAY! My only problem now is that encoding and burning takes SO long. Six hours for 2 one hour shows. Good one, you've solved it. I'm sorry, but transcoding video does always seem to take a lot of time. The time can be shortened by a more powerful and faster computer, more and faster CPU cores, more powerful and faster Video card(s), more video RAM and a harder working GPU, or even [ugh!] cutting down on the output dimensions and bit rate. However all these measures except the last, spend a lot of money for diminishing returns. I do much of my transcoding now at times when I have chores or other things to do, and I'm thankful my system is now fast enough that it doesn't take all night to encode something. I love VLC- it plays everything with no issues! I really do appreciate the time and advice specialist forums like these give to 'civilians' like me, who only come looking because there is a problem they need to solve! More over night burning sessions from now on then!